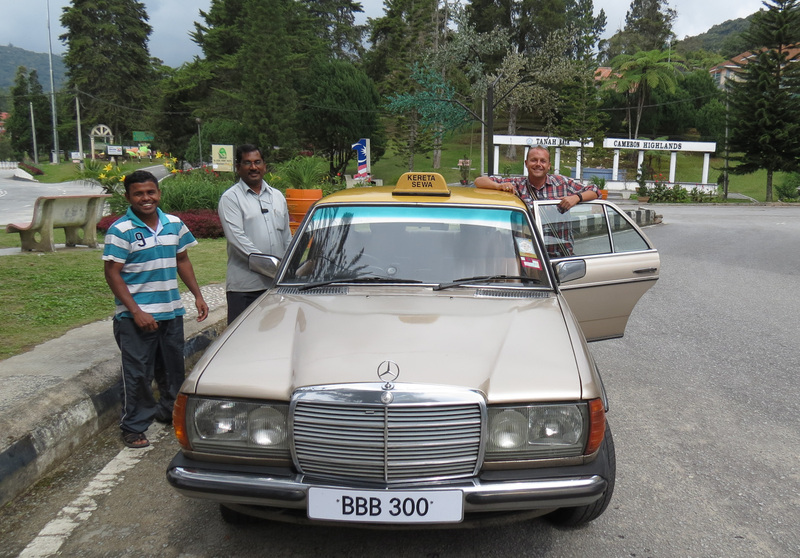 With the flavours of Penang still swirling round our taste buds we boarded our minibus and spent the next four hours slowly winding our way eastwards and upwards into the Cameron Highlands. 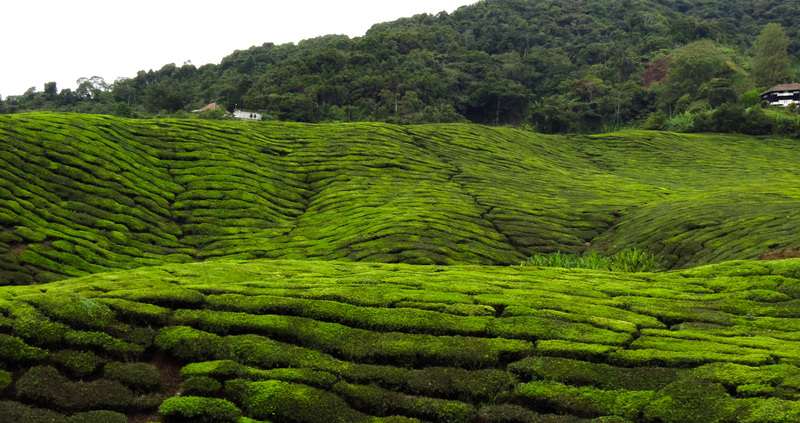 The Cameron Highlands get their very British name from the surveyor who charted the area in 1885. 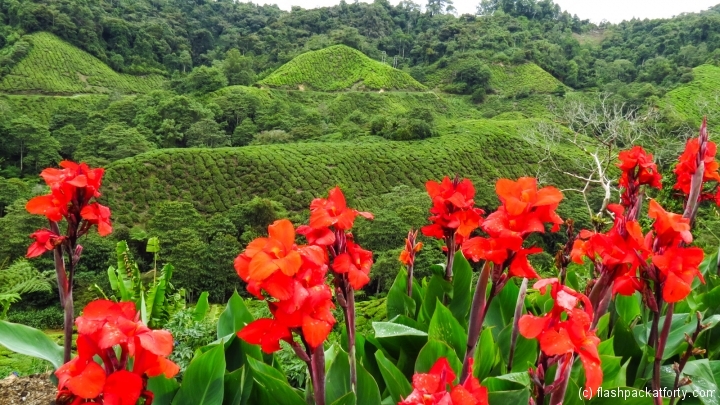 The road to the highlands was finally completed in 1931 when the British colonials, tea planters and other farmers transformed the place over the next 80 years to what it is now, Malaysia’s gardens in the sky. 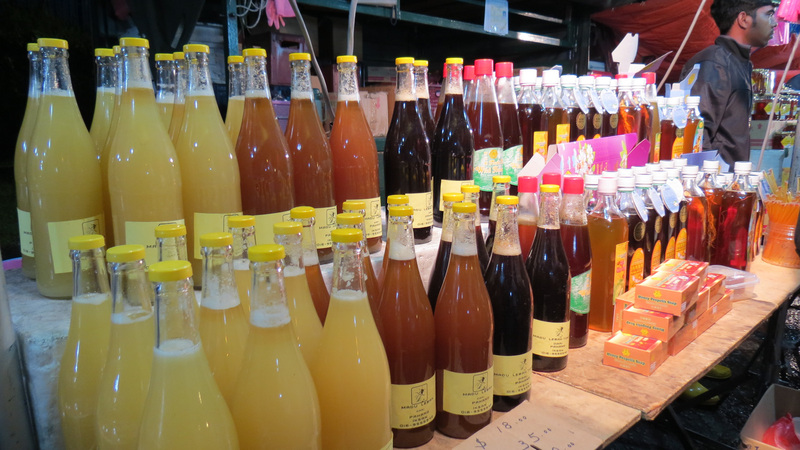 Still the thriving agricultural centre of Malaysia producing fruits and vegetables, honey and of course some famous teas. The climate is cool, never getting over 25 degrees and its soil fertile; perfect ingredients for its continued agricultural success. 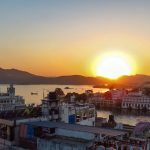 We were actually looking forward to the cooler air having spent the last few months in sometimes unbearably hot and humid temperatures on our journey through Asia. The last hour of the journey from Penang, are spent on the windy switchback roads that take you over 1500 meters into the sky. It sometimes felt like we were on an aeroplane as we literally passed through the clouds. 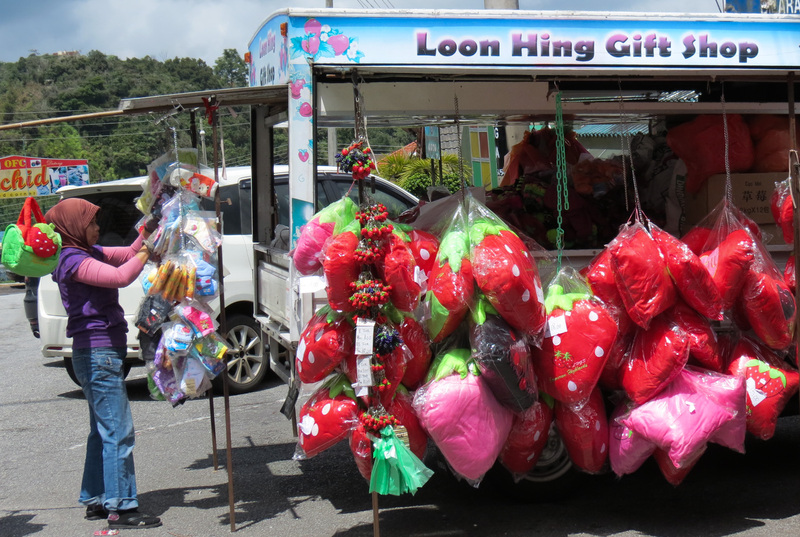 We knew when we’d nearly reached our destination, as we saw gigantic plastic strawberries dotted along the roadside, and stalls selling all manner of strawberry related souvenirs. From the edible to darn right ridiculous, anything you can possibly imagine either in the shape of a strawberry or with a strawberry pictured upon it was for sale. 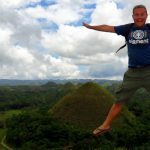 It was all a bit surreal, but fun in a kitsch way and doesn’t detract from the outstanding natural beauty of the area that you glimpse from the window. 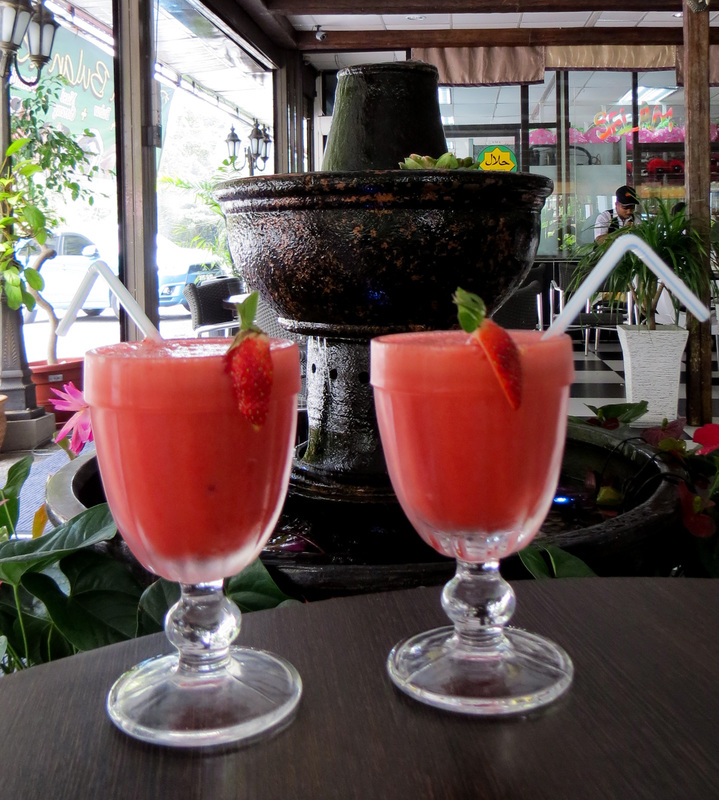 Strawberries, whether real or plastic, are big business here. One thing that does detract from the beauty is the large amount of deforestation taking place to ‘apparently’ provide land for agriculture. The environmental impact is clearly evident to the naked eye, as large swathes of forest are cleared of trees. We did hear some rumours, from the locals, that this is severely impacting on the ecology of the highlands, but thankfully local tour operators are raising awareness and discussing the issue with the government. 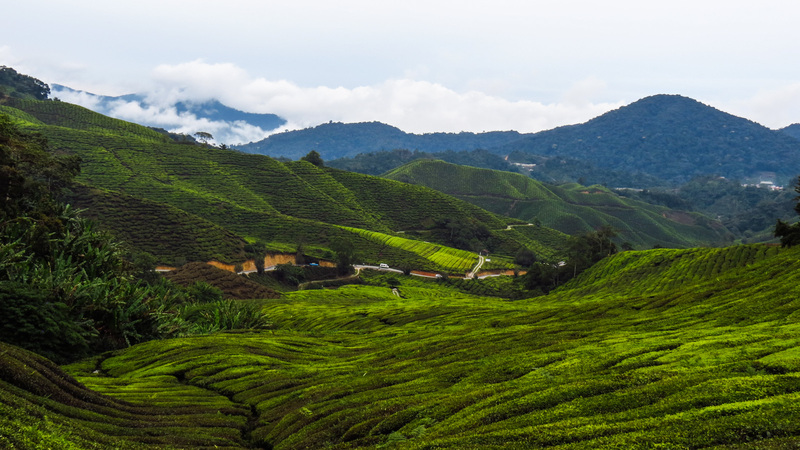 If your’e a member of any environmental or ‘eco’ campaign group in Malaysia, it is worth highlighting this issue, as the Cameron Highlands is a very special place and needs to be protected at all costs. 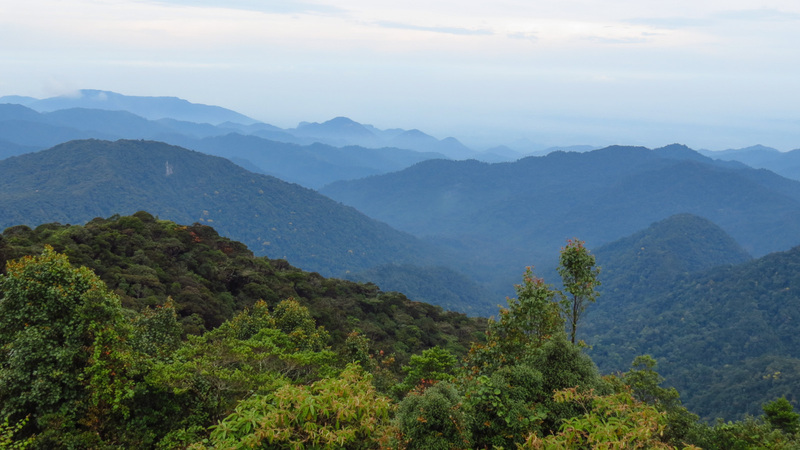 Having said that, you can not fail to be impressed by the virgin areas of untouched forests that cover the mountains as you look in awe at the incredible vistas still on offer. We had decided to stay at Brinchang, the accommodation is a little bit cheaper here and it is much less touristy than the one street town of Tanah Rata, five kilometres to its south. However, the choice of tour operators and types of places to eat is greater in Tanah Rata. 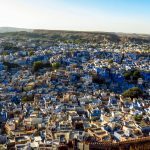 The fact that most of your time in these parts is spent either trekking or in the back of a land rover or minibus, who all do hotel pick-ups, it really doesn’t make that much difference where you decide to stay. There are lots of things to do in the Highlands; you can go on energetic hikes up the mountains (there are plenty of trails to choose from ranging from a couple of hours to eight hour plus hikes). 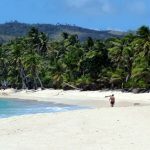 For the less adventurous, there are many tours on offer to discover the area. 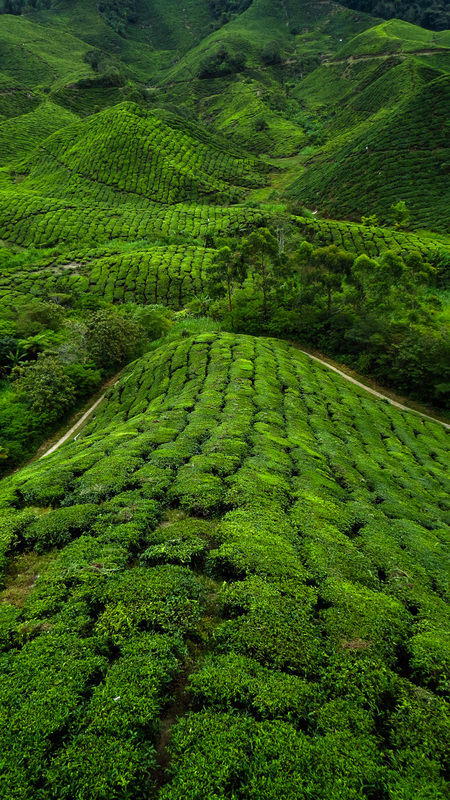 Most tour operators will take you to see the tea plantations, up the highest mountain in Peninsular Malaysia (Mount Brinchang) and for a wander around the enchanting mossy forest. 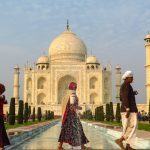 If you are really in tourist mode you can add the following to your itinerary a butterfly farm, an apiary, strawberry farm, water cress plantation, vegetable farm and the rose and cactus gardens. 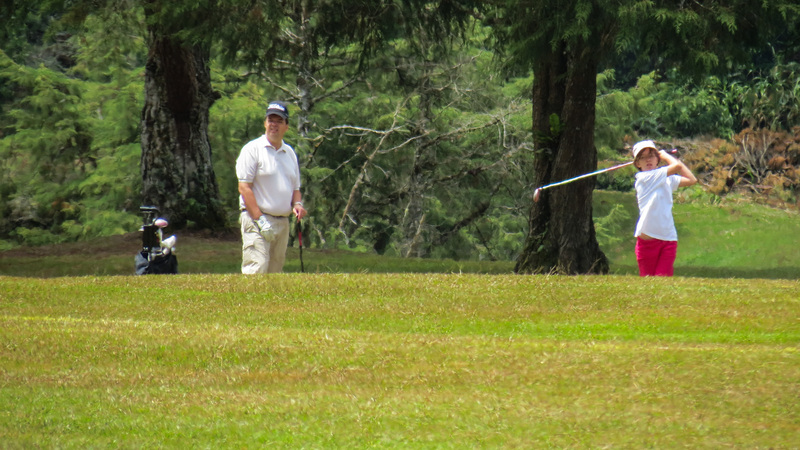 If you are feeling sporty you can do a round or two of golf at the prestigious Cameron Highlands golf course. 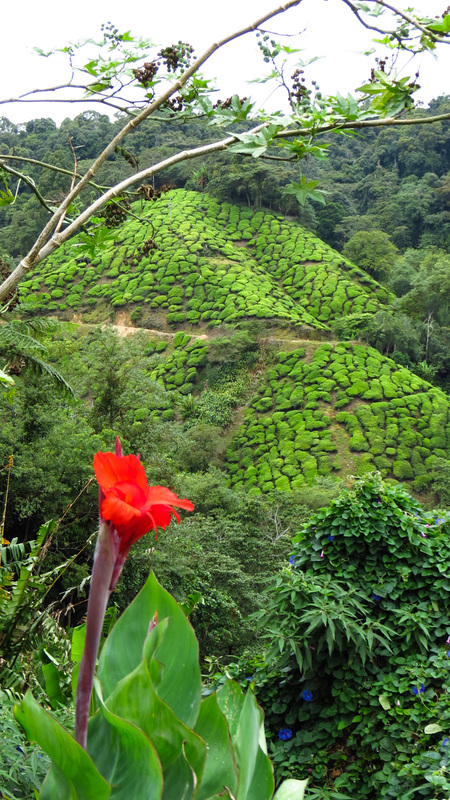 The Cameron Highlands is a firm favourite with the Malaysians and Singaporeans as a holiday destination. 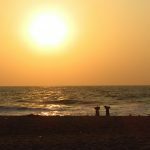 In Britain, when we have a bank holiday or fancy getting away for the weekend we all pray for hot weather and make a beeline for the nearest beach or jump on a plane and try to get as far south as possible to catch some heat and sun on our bones. 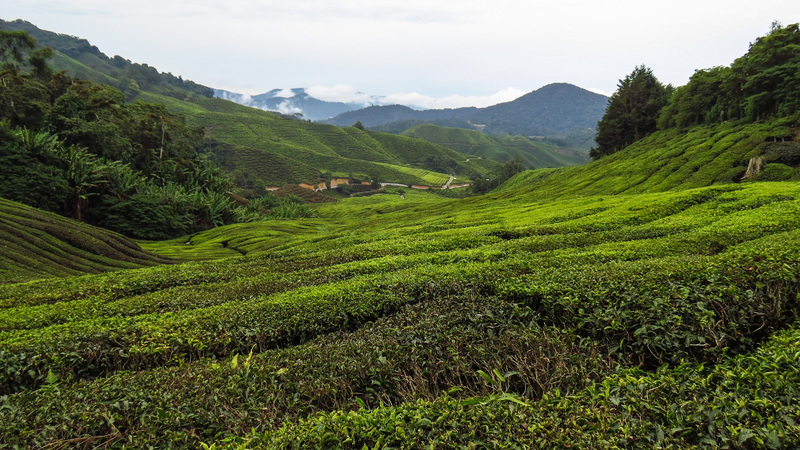 Here in Malaysia they do the opposite, they run for the hills to escape the heat of the cities and lowlands and bask in the cool mountain breezes and soak up the calm beauty of the highlands. Many people comment on how similar the climate is to that in the UK, and yes it is similar and could be compared to that of a good British summers day, but they don’t have four seasons here and certainly no snow. We experienced glorious weather here which made our outdoor pursuits all the more enjoyable. We were surprised at the large number of hotels available to chose from here, all seemed very quiet with plenty of vacancies. 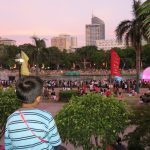 We were approaching the end of Ramadan, and Hari Raya was due to start in the next week with national holidays here in Malaysia. A local taxi driver told us that the place becomes gridlocked during this peak season, with road closures and hotels full to capacity. The road travel time between Brinchang and Tana Rata, rising from five minutes to forty as the traffic jams seize up the one lane highways here. 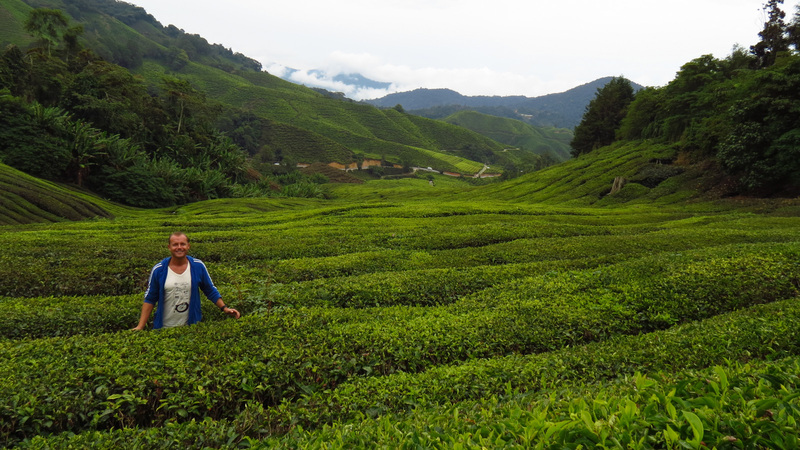 We eschewed the majority of farms (we are blessed with many Honey, fruit and vegetable farms from where we come from in England) and instead went for the forest, mountain and tea plantation trips. 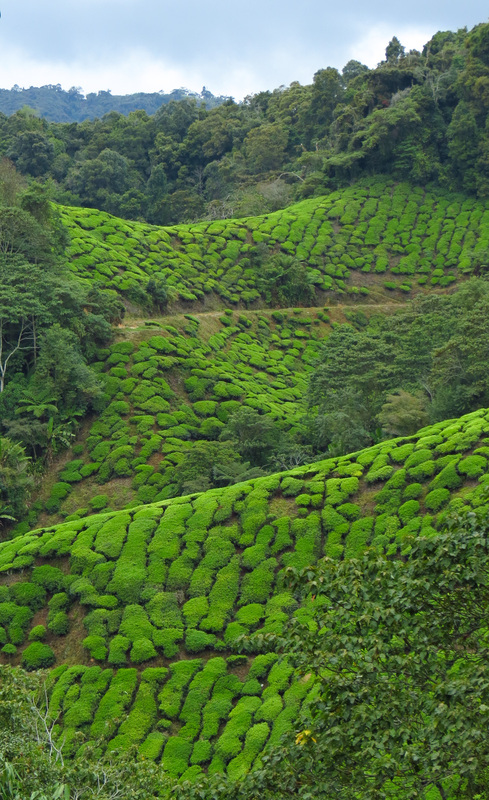 The tea plantations are dominated by the Boh tea company who own and manage hectares of the mountainsides here. They have been producing tea here since the early 1920’s. 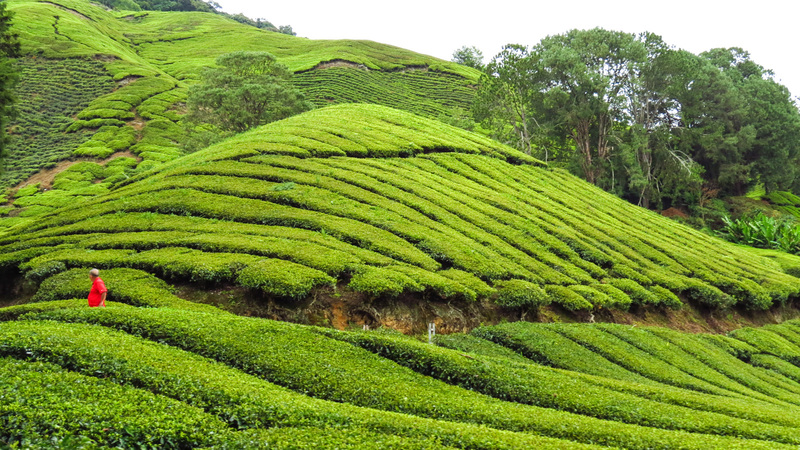 If their PR is to be believed they produce some of the world’s finest black teas. We sampled some at the end of our tour and while we can’t attest to this grand claim, it was very tasty. The spectacle of the plantations lie in the arrangement of the tea bushes which are neatly trimmed to table top height on mountainsides as far as the eye can see. Between each row of tea bushes are passageways, left to allow the tea pickers (or now the tea pickers with machines) to get by and clip the fresh young leaves off the top of each plant. These young leaves are bright green with the older leaves turning a darker green underneath. It is this contrast between the unpicked brighter leaves and those showing only the older darker leaves which makes this a stunning mountainside spectacle. 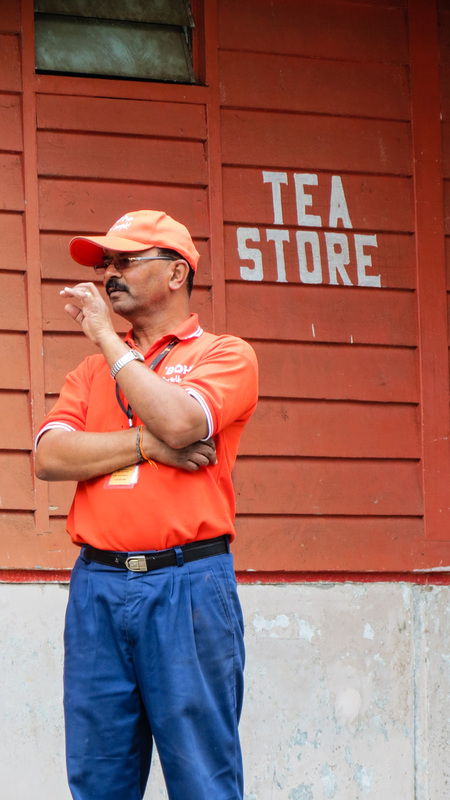 After you have finished marvelling at the vistas you can go and have a look at the tea processing plant in the factory that is strategically located by the wonderful floating cafe run by the tea company. Here you can pick from their finest tea selection and enjoy a cake and a cuppa enjoying the views of plantations below. 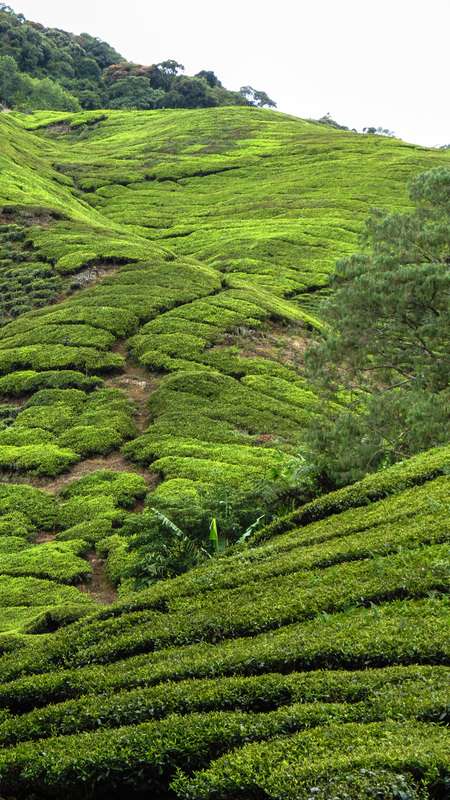 The mossy forest near to the tea plantations is a good place to wander amongst the cushion soft moss underfoot and try and find some of the more exotic plants and flowers that have chosen this as their home. 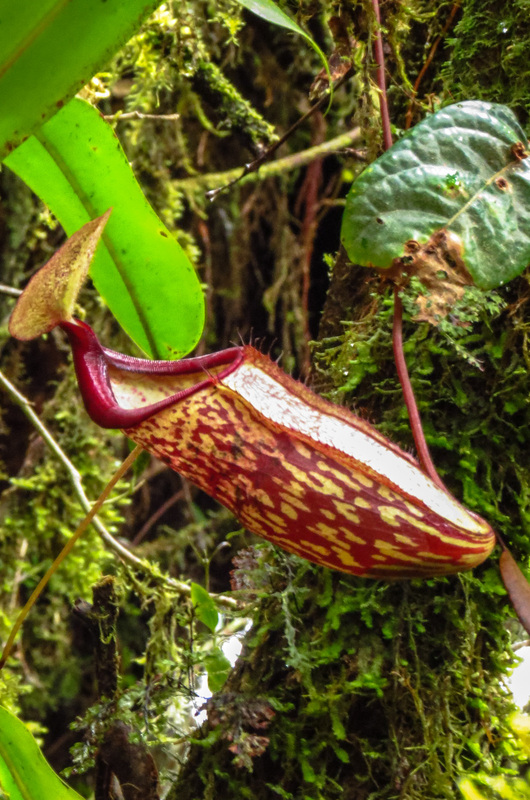 There are a few carnivorous plants and some impressive wild orchids hidden amongst the moss covered bark of the trees and branches here. The Cameron Highlands is abundant in flora, and on a separate trip you can see the largest variety of flower in the world, the rafflesia, but be warned take a nose peg! If you have a wonderful clear day you can climb up the watch tower which sits at the peak of Mount Brinchang and enjoy 360 degree view of the nearby mountains and jungles. Sadly, it was a little grey when we arrived, so these wonderful views were interrupted by some pretty dense cloud. It was still breathtaking to be stood aloft the highest mountain in Malaysia. The best bit is the tour bus/jeep will take you all the way there so you don’t even arrive huffing and puffing. Brilliant! 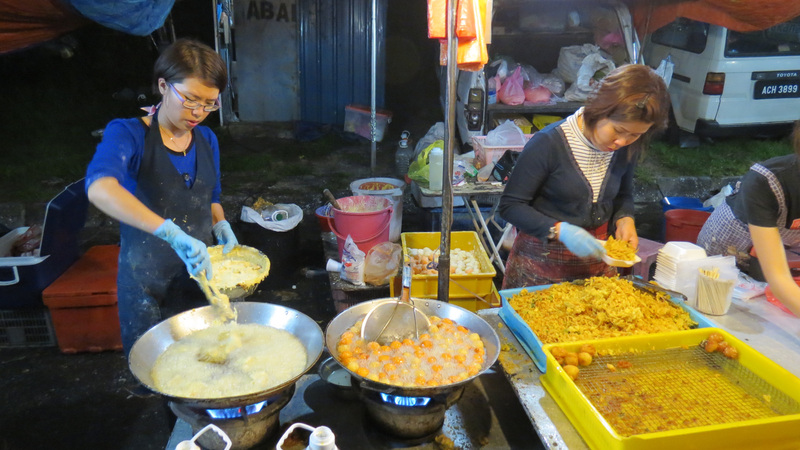 Every weekend in Brinchang you will find the night market sets up camp at the top end of the village. This being Malaysia the market is mostly about food with sweet corn and the ubiquitous strawberries and honey for sale. These are sold fresh or made into a whole host of mouth-watering savoury and sweet snacks for you to try. Thankfully, we hadn’t eaten that evening and arrived at the market hungry, so our dinner came from the stalls in the form of freshly barbecued sweet corn, tempura watercress, wild mushrooms, sweet potato balls and peanut and sweet corn folded pancake rounded off with chocolate covered strawberries. We were gutted though, as we’d never eaten day lilies, as all the stalls ran out of this menu item by the time we were ready to order. 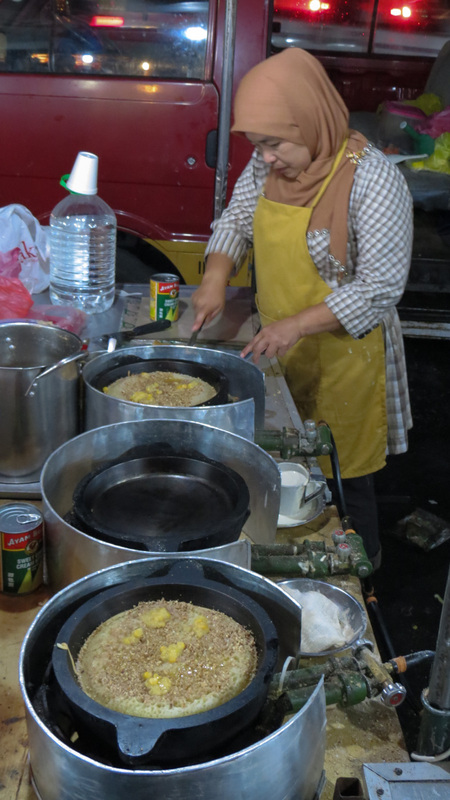 A very tasty al fresco dinner for about US $7 between us. 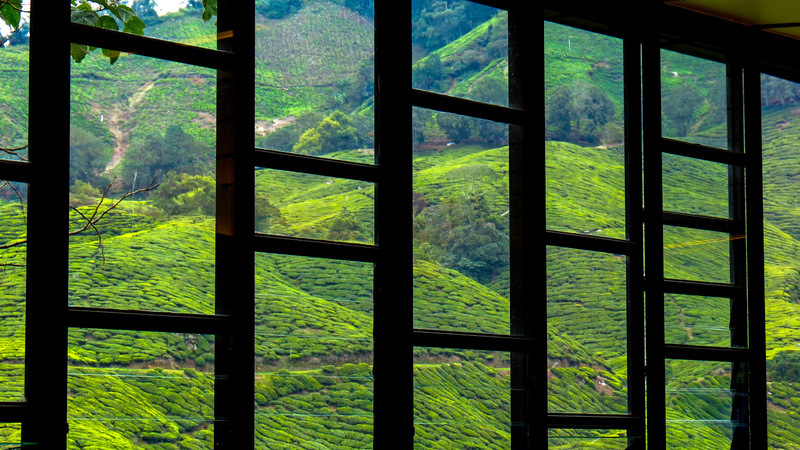 The Cameron highlands are cool and it’s not just the temperature. 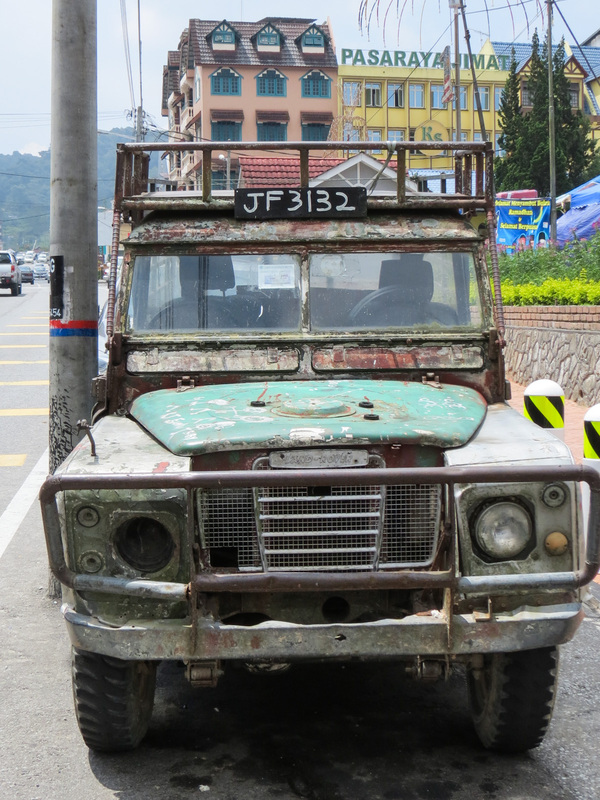 We liked the hundreds of (mostly very old) Land Rovers chugging about the place bellowing out 1960’s exhaust fumes. Apparently, the older models are superior than newer versions hence their popularity. 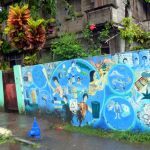 We finished our stay here with a visit to one of the local Chinese reflexology shops to have our feet ‘reflexed’ and our ailments diagnosed. We were told that John and I have problems with our shoulders and I have a neck problem too, which was news to us. All this wonderful diagnosis was completed by feeling my feet while they were massaged for an hour. Not sure about the medical validity of this, but it was a wonderfully relaxing end to our Cameron whistle stop tour. 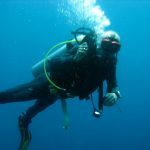 Its back to the heat next as we head further east to the Perhentian Islands for a bit of rustic charm, and hopefully for a me a bit of diving. 2 Comments on "Cameron Highlands: High in Malaysia"
Hey.. how do the cameron highlands compare to Sapa, Vietnam in your opinion? We loved Sapa. is it ok if i posts some comments there too? we had a great guide and room and i’m sure way more people will see your blog than mine. Yes no problem comment away. 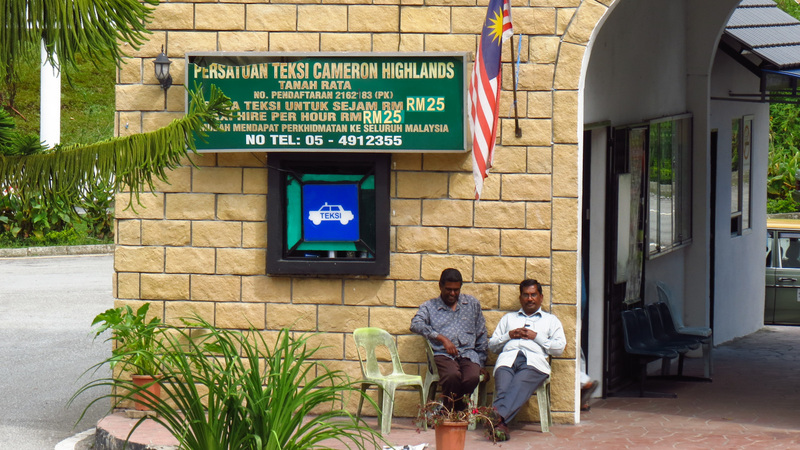 Cameron is less about the tribes(the only trip into local villages is no longer available), but the cool air, the sights and the general ambience is lovely. Treks are good too if you are feeling energetic.